Each and every day, satisfied customers tell us about their great experiences and the helpful team at AutoZone. How does that happen, day after day, for more than 39 years? Because AutoZoners always put customers first. And we provide great support, training and encouragement to help our fellow AutoZoners drive their careers, gain valuable experience and be part of an industry and community leader. Interested in learning more? AutoZone, headquartered in Memphis, TN, is a growing Fortune 300 company with a deep commitment to serving our customers, communities and fellow AutoZoners. We have vast opportunities in our stores, distribution centers, field offices, specialty business units and Store Support Center and embrace diverse experiences, backgrounds, knowledge and ideas to strengthen our teams and business. Our team is connected by a deep commitment to our Pledge and Values, principles established more than thirty years ago that reinforce our priorities and team culture. In addition, we constantly innovate and aspire to best serve our customers, creating new and better tools, training and outreach to serve both DIY and the professional installer customers. From in-store tools to E-Commerce, training and development to recognition, our team has the tools to help you grow your career at AutoZone. See where your drive will take you! In addition to our customer-focused culture and team-oriented environment, we are proud to offer a competitive benefits package. The following benefits only apply to AutoZoners in the United States. AutoZone Mexico offers a benefits package aligned with regional and competitive market practices. These benefits, among others, include life insurance, savings fund, food coupons, vacation premium, 20% discount on AutoZone merchandise, and bonuses. AutoZone is the top retailer in the automotive aftermarket and one of the top distributors of automotive replacement parts and products in the US. It takes a lot to be the best and we need the best talent to support our businesses. Starting with our first store in Forrest City, Arkansas in 1979, AutoZoners have built more than 6000 stores, 10 distribution centers, one of the 10 largest private fleets in the United States and four specialty businesses including two online businesses (autozone.com and AutoAnything.com) and a software company (ALLDATA). At the same time, we’ve created over 80,000 jobs, which are located in the US, Mexico, Brazil, Canada, Germany and China. And, there’s still a lot of growing going on. AutoZone has hundreds of different types of jobs and career opportunities. While many of our team members follow more traditional career paths (e.g., part-time to full-time sales, store manager, district manager, regional manager, vice president and beyond); we encourage cross-functional development. Most of our leadership team has held positions in two or more areas of the business. Whether you’re in Finance, Merchandising, Supply Chain or IT, we want you to look at your career through the lens of “what’s interesting now”. As an AutoZoner, you’ll have the ability to charge of your future by developing new skills, leading people and being part of industry innovations. We encourage you to join us and see where your Drive Can Take You as part of our exciting team of leaders, entrepreneurs and contributors. At AutoZone, your career can be all that you imagine and more. 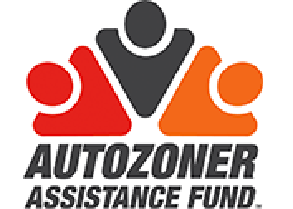 One of AutoZone’s Values is Cares About People, and with that in mind, we created the AutoZoner Assistance Fund (AAF), a public non-profit charity supported by AutoZoners through an employee giving campaign. The AAF provides immediate short-term financial assistance to AutoZoners and their immediate family members who are victims of natural disasters and personal tragedies including, but not limited to, illness, accidents, death and catastrophic events. All AutoZoners (full and part-time), their spouses and legal dependents who have experienced loss as a result of a natural disaster or personal tragedy are eligible. The AutoZoner Assistance Fund is only available to AutoZoners in the United States. We are a company that believes in the power of community. We know that real change comes when people work together for the betterment of all. That is why AutoZone encourages AutoZoners to be active members of their community, and supports their monetary contributions to nonprofit organizations through The AutoZone Matching Gift Program. We are a company that believes in leading by example, with more than half of our leadership serving as active board members for nonprofit organizations. AutoZone is proud to support the many communities where we work and operate. We have several programs to provide both funding and in-kind support to tax-exempt, nonprofit organizations. We primarily focus on supporting organizations providing resources, services or information that helps individuals and families lead healthier lives, provides educational tools, services or opportunities that extend from early childhood to higher education, offers youth the opportunity to develop self-esteem and build character, provides resources that help prevent and reduce crime or supports our military service members and their families.